I'm in the airport waiting to board a plane. I'm bound for a Girlfriend Getaway! Stories and photos to follow when I get home. 10 of us gathering for some fun. Can you say " Five Day Slumber Party"? .I keep gathering all sorts of things for the wedding and Lil' Mama and her guy are gathering all sorts of thrifted furniture for the apartment they'll have. 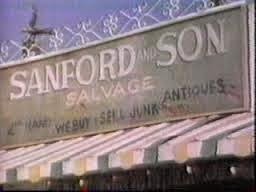 Remember the old TV series, "Sanford and Son"? This may have been how they got their start?! Someone's trash has become our treasure! I was driving home through our neighborhood and found this (the arbor - not Lil' Mama's fiance) curbside among trash for pick up. I went home and got Lil' Mama and we went to claim our "find". We somehow wrangled this big ol' arbor part way into the back of the SUV - much of it was hanging out the back. Lil' Mama sat in the back holding onto the "find" enough to allow us to get it home. Trust me when I say the photo makes it look much better than it actually looks close up. It needs a lot of TLC. It needs some repair, sanding, priming, and heaven only knows how much spray paint. But we are up for the challenge. 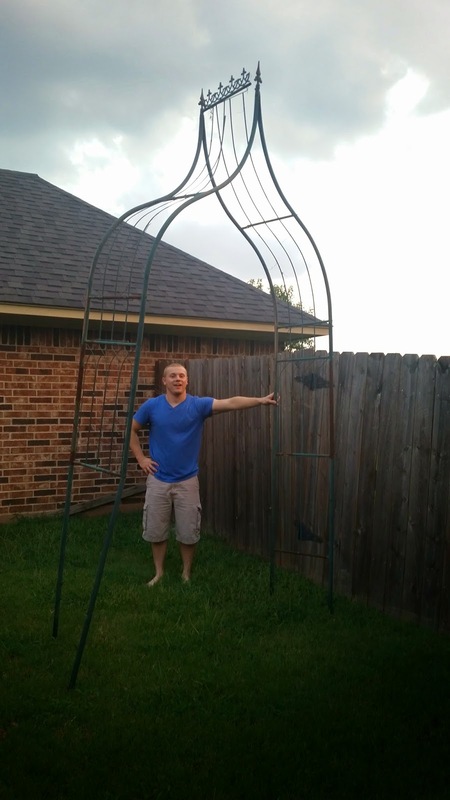 We think it'll be great for using for Lil' Mama's wedding, and then I'll have it to put in my rose garden. Win/Win. We're waiting for a little cool weather then we'll begin the transformation project. I'll try to remember to post before and after photos. Love me a good find!